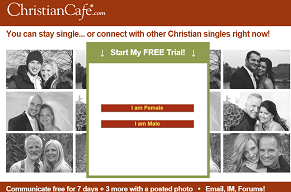 Christian Cafe is one of a growing number of dating sites that cater specifically for singles of a particular faith. They are a great choice for any Christian that is looking to find love with someone who shares their religious beliefs. Christian Cafe has been around since 1999 and has a great reputation – they claim over 2,000 success stories from members who have found love at this site. The website itself is well designed and easy to navigate, and if you are a new member you can take advantage of a 7 day trial that allows you to try it out for free. There is quite a range of dating sites in the Christian dating market, and Christian Cafe definitely stands out as one of the best. As it is owned and managed by Christians, you can be confident that they have an insight into what is important to members of this faith. There is a great deal of focus at Christian Cafe on ease of use, so signing up is a nice and simple process. You just have to provide some basic information and you are ready to start creating your profile. This involves answering a selection of multiple choice questions and some free form questions too. One section of these questions is all about your faith, and you will be asked about your church denomination, your level of church involvement and your favorite scripture. You don’t have to provide a response to every question and you can skip anything you are not comfortable answering. You can always come back to any questions at a later date, and the information will then be added to your profile. Photos can be uploaded to your profile too, but these have to be approved before being added. Anything that is deemed inappropriate will not be accepted. Searching for matches at Christian Cafe is also easy to do, and very flexible too. You can perform simple searches based on the basic information contained in a profile or you can do advanced searches with more specific criteria. You can search for other members that are currently online and for new members that have recently joined. There is also a match feature which will automatically provide you with matches of members that gave similar answers to you when creating their profile. Once you have found a profile you are interested in you can send a wink to let the person know you are interested or you can contact them directly through the site. When using the instant messaging feature you don’t have to provide any personal contact information until you are comfortable, so your privacy is ensured at all times. You can write messages in text format or, if you prefer, you can send messages using audio or video. The main additional feature offered by Christian Cafe is the forum. The community aspect is a big part of this dating site and group conversations on the forum are actively encouraged. You can use the forums to meet people without having to search through profiles, or simply to chat with other Christian singles about dating and a variety of other topics. There is also the Post a Prayer feature which allows you to let other members know you are praying for them. Christian Cafe can be accessed from your mobile phone using free applications for the iPhone and Android phones. These applications offer full functionality so you can search, browse profiles and send/receive messages even when you are not in front of your computer. All new members are entitled to the seven day free trial at Christian Cafe, and there a number of subscription options for the paid service. You can pay for a two week membership for $29.97 or a full month for $34.97. If you are happy to pay for multiple months at a time, you can get a much cheaper rate. A three month subscription costs $47.97 ($15.99 per month) and a six month subscription costs $77.97 ($12.99 per month). There is also a 12 month option which costs $107.97 and works out at just $8.99 per month. We are happy to recommend Christian Cafe to our readers as we believe it is one of the best dating sites of its kind. It is easy to sign up, create a profile and get in touch with other members, and they have a large database of members. A particular advantage is the fact that all inactive profiles are removed after 90 days. Many dating sites don’t do this and it can be very frustrating to find a number of matches only to discover they are no longer using the site. At Christian Cafe this is unlikely to be a problem as their membership list is kept up to date.